FOR IMMEDIATE RELEASE: Lewiston, Maine (December 5, 2016) –New England Fights (NEF) returns to the Androscoggin Bank Colisee on February 11, 2017 with its next mixed-martial-arts event, “NEF 27: RESURGENCE.” Earlier today, the fight promotion announced the addition of a professional featherweight bout to the card. Josh “Hook On” Harvey (2-0) will meet Richie Collingham (3-3) at a fight weight of 145-pounds. Harvey is a former NEF MMA Amateur Lightweight Champion. He turned pro in 2016 after a stellar amateur career that saw him amass a record of 5-1 while facing some of the best the region has to offer. In his pro debut, Harvey submitted Matt Denning (3-4) in Lewiston last spring. He would follow up that victory with a win over Zenon Herrera (0-5) in August. Harvey is a member of Young’s MMA in Bangor, Maine. 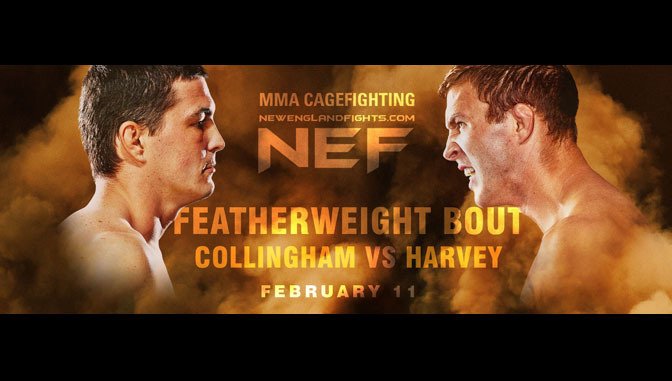 When Richie Collingham steps foot in the NEF cage on February 11 it will have been nearly a decade since his last fight. Now training out of Lakes Region Vale Tudo in New Hampshire, Collingham has not actively competed since 2007. He was very active on the California MMA circuit at that time and put together a string of submission victories.